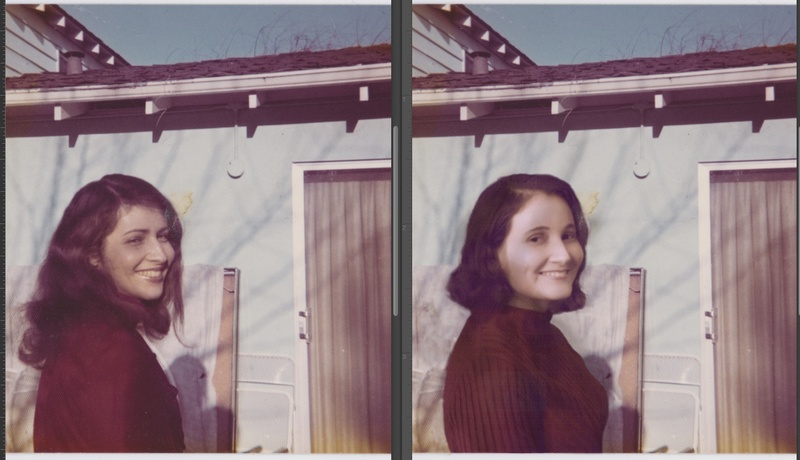 In November 2014, filmmaker/photographer Angela Park, graphic designer Tara Nitz, costume designer/makeup artist Kathryn Wilson, and hairdresser Tammy Rupe came together to help me recreate some photos of my parents, grandparents, great-grandparents and cousins. 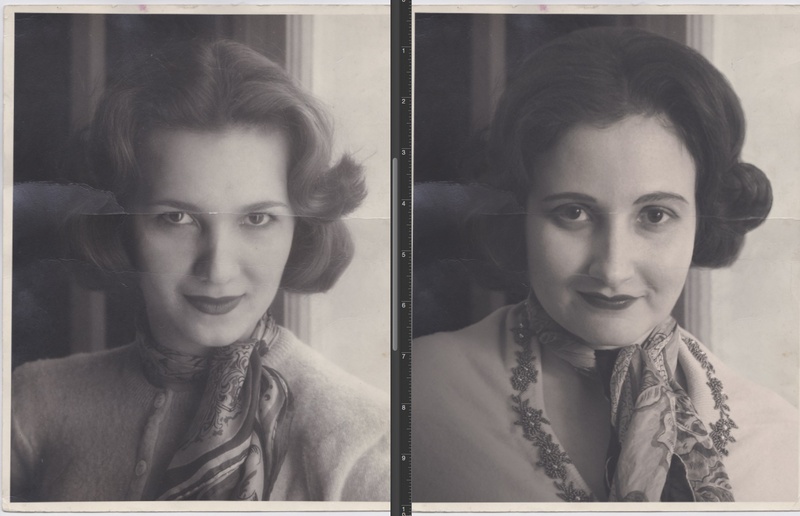 The pictures highlight family resemblance, showing that many different family members’ features can be found in one person’s face. It also illustrates how many people it takes to create one person. The idea is to get people thinking about the similarities and stories in their own families. 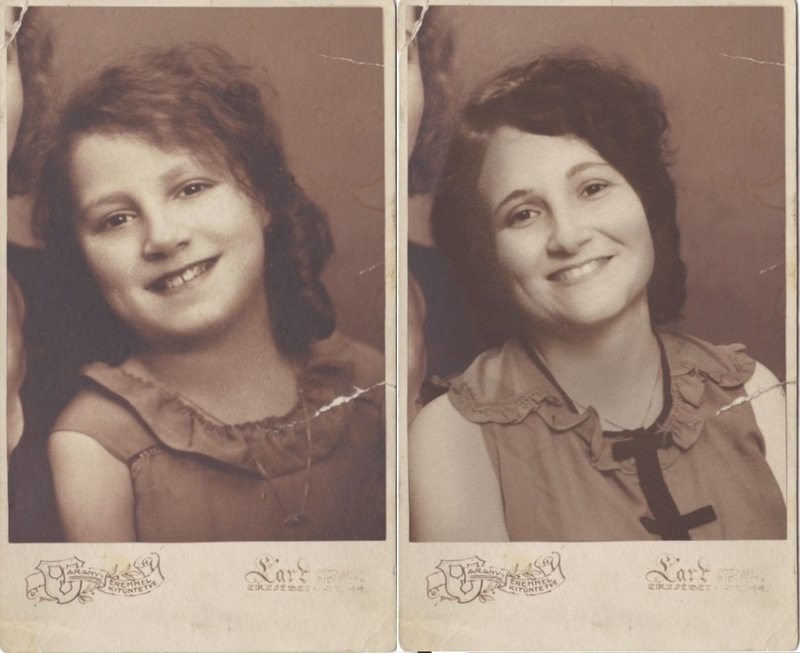 As a personal historian (i.e., I help people write their life stories and turn them into books), I’ve had many people tell me that they regret not knowing more of their family stories. 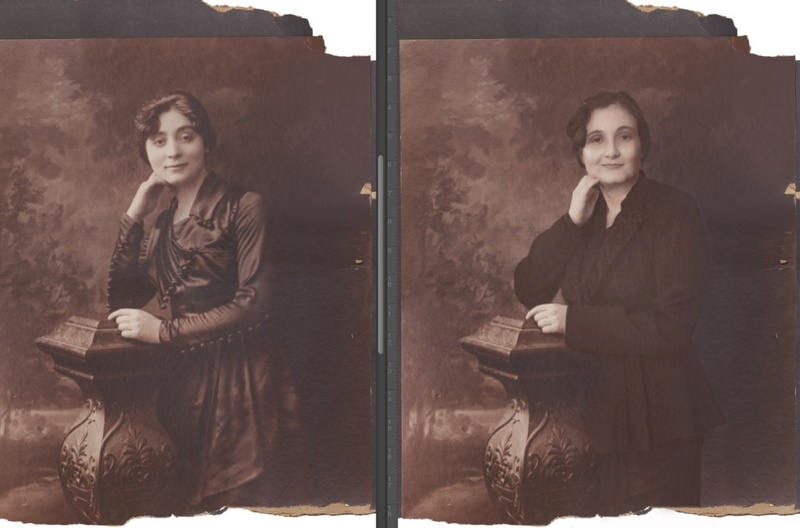 I hope this project encourages people to take an active interest in their family history. Because the more we know about our family history, the more we know about ourselves. It all started about a year ago with a picture my aunt found of my maternal great-grandmother Fannie. 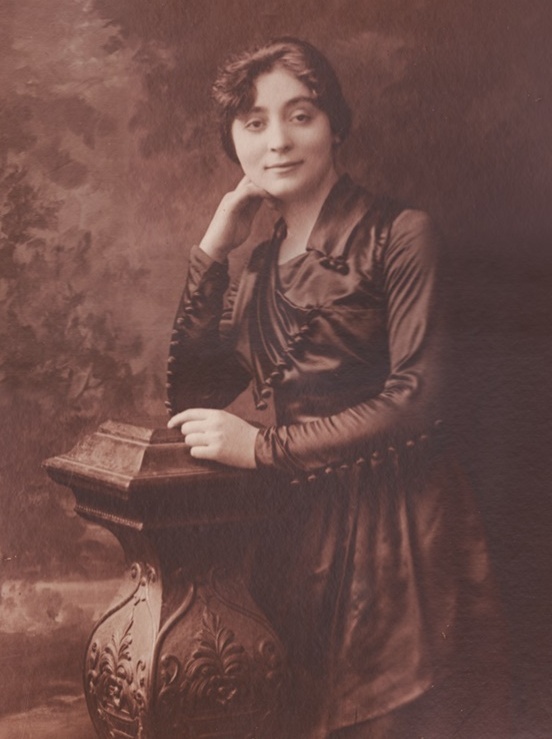 Based on how old she looks and the style of clothing, the picture is probably from sometime between 1915 and 1920. In it, she’s young and beautiful, with a slight smirk on her face. In a time when most people looked stoic in pictures, she’s serving up the sass. 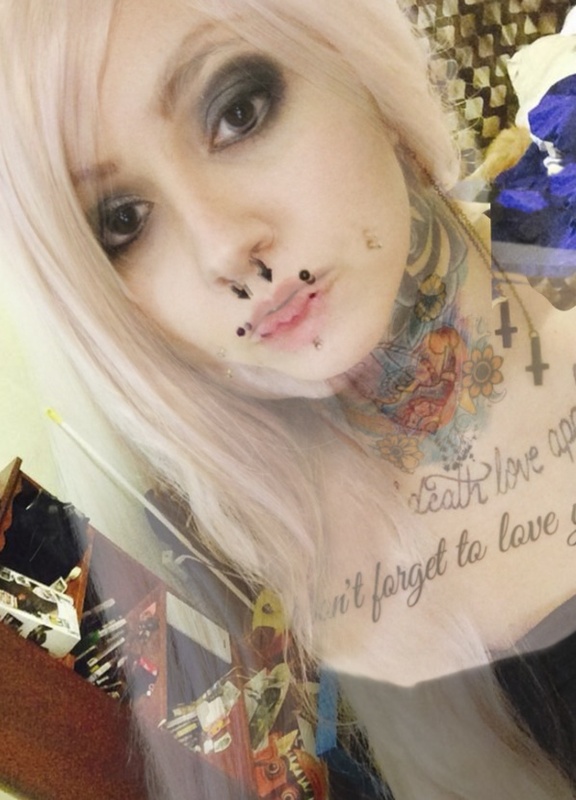 I was curious if I could imitate her expression, so I grabbed the picture and stood in front of the mirror. I was surprised to find not only matching smirks, but a strong resemblance overall. People always told me I looked like both my mom and dad, but it never occurred to me that I might look like anyone else. From then on, I was on a search for family members with similar features. In the end, I came up with eight relatives (including Fannie). Fannie immigrated to New York from Poland. She was married to a grocer who died at the age of 48, had three kids, and was a big worrier. Similarities: Eyes, cheekbones, hair, and chins. I am also a champion worrier. 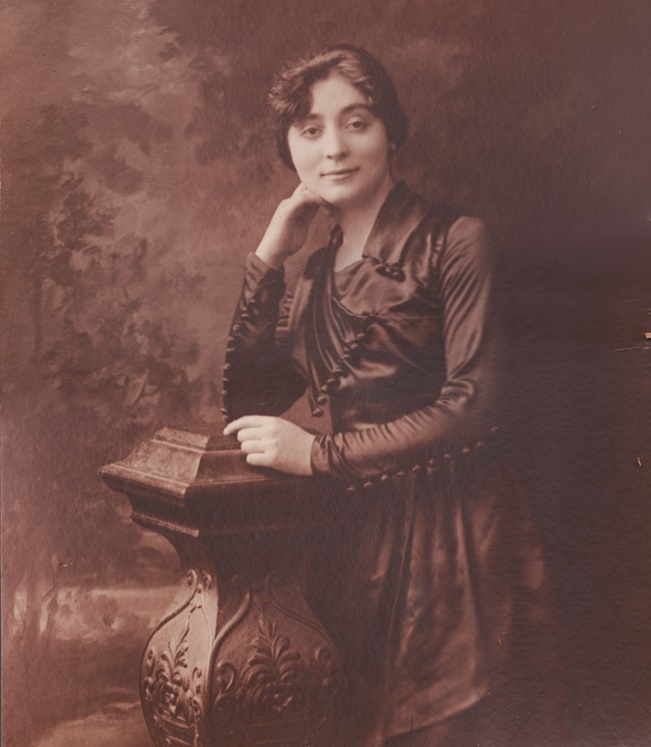 Hermina was my great-grandmother Charlotte’s sister. She stayed in Hungary when the rest of her family immigrated to the U.S. because she felt she couldn’t leave her clothing design business. 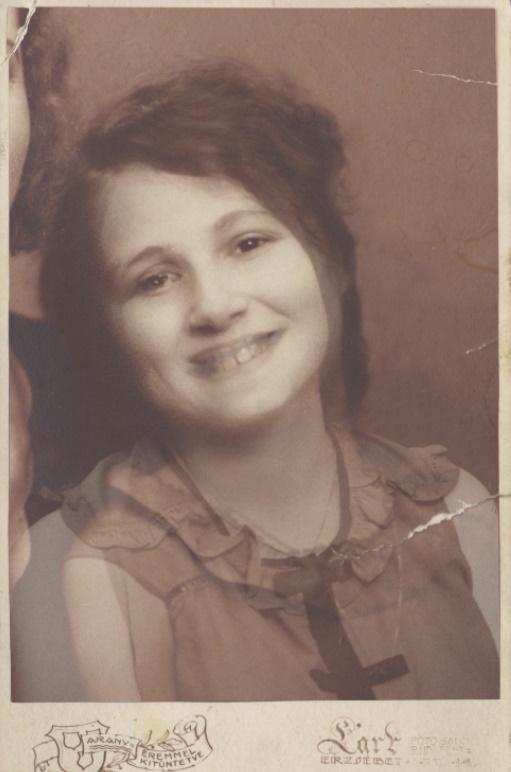 According to a family tree, Hermina died of cancer in 1934 and her daughter, Ibolia, died at Auschwitz in 1944. I think the picture is from sometime in the 1930s. I posed as Ibolia, who looks about 10 in this picture. Similarities: I’d seen this picture plenty of times, but had no idea we looked that alike until I dressed up as her. We share smiles, cheekbones, noses and hair. I wish I knew what else we had in common. 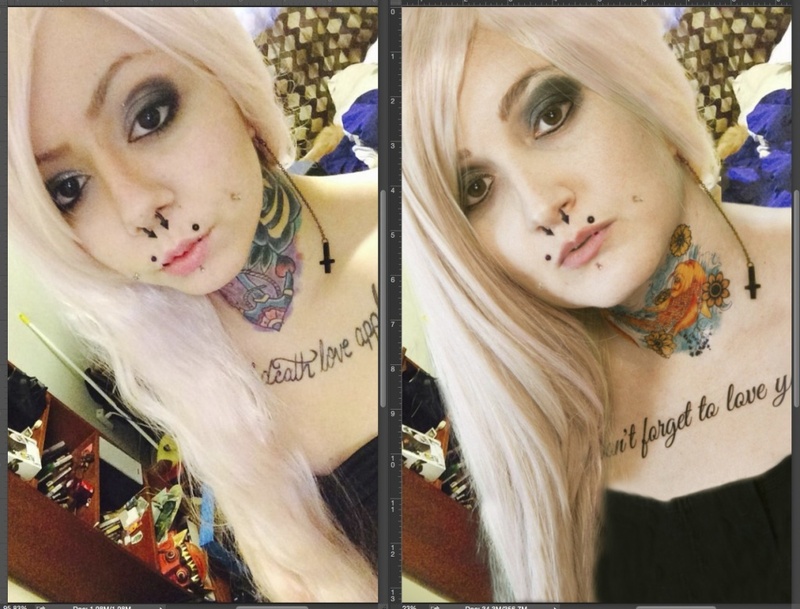 For fun, here’s an overlay of our pictures. In a letter, my grandfather Sidney asked his aunt Mildred what his grandfather was like. Mildred said that he used to sell lottery tickets for Irish Sweepstakes and once ran a concession stand at a bathhouse with my great-great grandmother. He was also a religious man who went to the synagogue everyday. He died in Poland at the age of 53. “He didn’t live to see one child married.” The picture was probably taken sometime between 1900 and 1910. Similarities: The resemblance is kind of eerie. Our face shapes, eyebrows, ears and foreheads all look pretty alike. I was surprised by this one. Of all the pictures, I thought I would look the least like my great-great grandfather. I’m not sure what else we have in common. Mildred’s description didn’t give me a lot to go on. My grandfather was an internist, psychiatrist, writer and voracious reader. He wrote an unpublished (though it wasn’t for lack of trying) memoir about his time in the Korean War and kept a journal. He was a quiet man with a good sense of humor who almost exclusively took care of my grandmother after she developed multiple sclerosis. 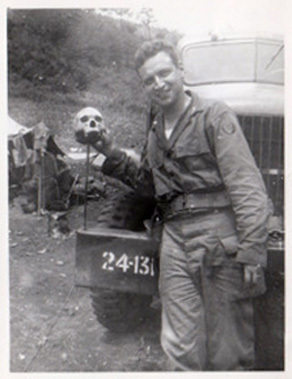 This picture was taken in 1952, on my grandfather’s way home from Korea. Similarities: I thought the family resemblance would be more obvious. We kind of have similar chins, ears and cheeks. Otherwise, we have our writing styles, love of travel, and senses of humor in common. My grandmother Ruthie said she and her first cousin Thelma fought a lot. Apparently they were very competitive with each other. Drama seemed to follow Thelma throughout her life. Her husband wasn’t very nice, her daughter was a handful, and she died at an early age. The picture is from the late 1940s. Similarities: Noses, eyes, and hair. Sadly I couldn’t quite capture her saucy look. We share a mischievous streak. Sensitive and caring, my mom Rosalie was a stay-at-home mom with a background in therapy. She loved her family, nature, animals, mystery novels, crossword puzzles and Boggle. Was a big worrier like her father (Sidney) and grandmother (Fannie). The picture is from the mid-70s. Similarities: Way too many! Faces, height, temperaments, love of books and words, anxiety, caring nature, silliness. My dad Steve is a runner, vegetarian, devoted family man and retired engineer. He has a good sense of humor and likes science fiction. He was 5 in this picture. Similarities: Big cheeks, smile, dimples, lips, ears, senses of humor, predilection for the absurd. Tiffany is from a side of the family that I’m just getting to know. I haven’t actually met her in person yet because she lives in Michigan and I live in California, but we’ve talked. She’s about 10 years younger than me, enjoys anime and cosplay, and is an overall fun, open person. Similarities: Noses, chins, cheekbones, dark senses of humor and large imaginations. Find out what you have in common with your own family here. Angela Park is a filmmaker, editor, sound recordist, and camera operator. She was the photographer. Tara Nitz is a graphic designer and prop maker with production experience. She helped Angela with the lighting and was our Photoshop guru. Katie Wilson is a costume designer and makeup artist. She located and rented appropriate costumes and did makeup. Tammy Rupe is a hairdresser, nail and makeup artist. 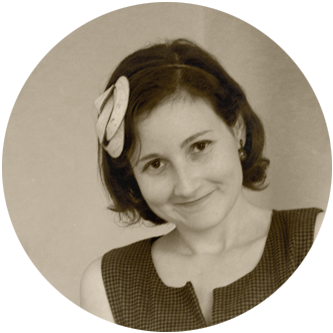 Rachael Rifkin is a ghost writer/personal historian. She was the subject of the photos. Libby Atwater is a friend and fellow personal historian. She recently came out with her first memoir, What Lies Within (which just won the Royal Dragonfly Book Award in the biography/memoir category), and is already at work on her second, What Took You So Long? Libby was adopted at birth by a nice Jewish family. Years later at the age of 56, she was ready to find, meet and get to know her birth family. 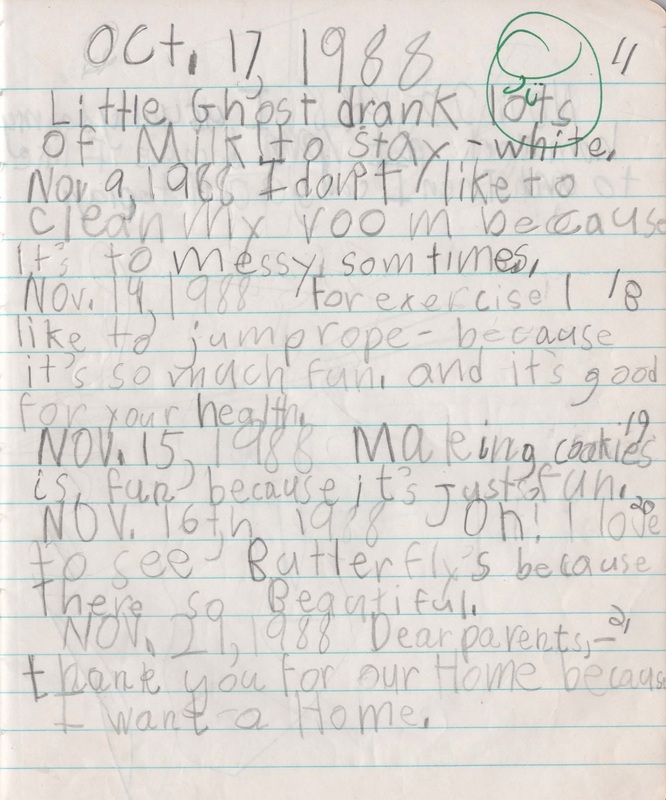 I asked her to write a guest post exploring the things she had in common with both families. You’ll find her post below. Ten years ago I celebrated my 35th wedding anniversary with my husband, Don, sons Darryl and Ross, and daughter-in-law, Kendi. I had a loving husband and two wonderful sons, and was a successful writer, but something was missing from my life. I pondered whether it was time to research my roots. Adopted at birth and informed at age two, I forgot this fact until a mean-spirited classmate taunted me with it in sixth grade. 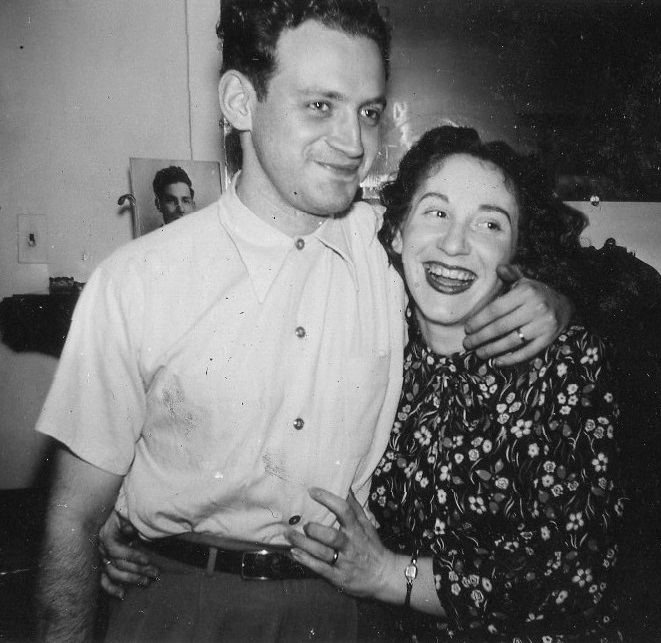 My older Jewish parents, Ruth and Harry, confirmed my classmate’s taunt and assured me that they were my parents. But Ruth and Harry died when I was a teenager, and my sister Blanche, four years older and also adopted, disappeared from my life in 1979. Much of our family history left with them. Now our son Darryl planned to start his own family. He knew our family’s health history, but no one knew mine. It was time to find my birth family at age 56. 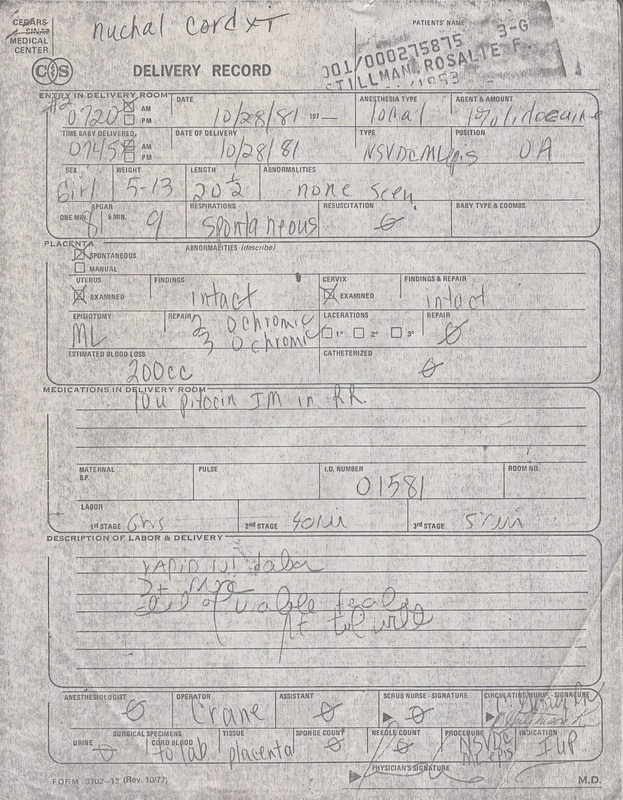 I rummaged through my late parents’ papers and found my original birth certificate. Armed with my birth mother’s name, I contacted six people I found online whom I suspected might lead me to my family. Within an hour, I received an email from Jerry, the person I thought might be my brother. He was shocked when I told him why I needed to contact Angela, who was listed as my birth mother. My birth family was Italian and practiced omerta, a code of silence. Jerry promised to get back to me. The following day he called with this news: I had a mother, brother, and sister who wanted to meet me. Jerry was my first cousin, and I was the long-lost baby given up at birth. Only six people knew of my existence until that day. Two weeks later I boarded a plane and headed east to meet the family of my birth. My brother, John, had called daily since we first spoke, and he’d emailed family photos so I’d recognize them. In the terminal stood Angela, an olive-skinned, petite woman with black hair and hazel eyes; my sister, Barbara, a pretty blond with hazel eyes; and John, whose striking white hair contrasted with his huge, sparkling brown eyes. During my four-day visit, they plied me with questions, fed me abundantly, and introduced me to my large extended Italian family by giving a welcoming party. I felt like I was in the scene from the movie Antwon Fisher in which his father’s family throws him a huge party to welcome him back. From the day Libby met her birth mom, sister and brother. I learned so much on that first visit. My parents were 15 and 16 when I was born, and my grandfather insisted that I be put up for adoption. He arranged to place me through a family doctor. When Angie became pregnant with John nine months after I was born, she and Bob married. They remained married for 55 years and had more children, one of whom died at 13 months old. My mother said I looked like my father who’d died only 13 months earlier. I shared his stature, thick, wavy blond hair, daily apples, love of rock and roll, quick temper, kindness to strangers, and his determination. My looks belied his Dutch-German heritage, as did Barbara’s. I have Angie’s mouth, literally and figuratively, as when colorful language bursts forth; her hazel eyes, love of fashion, and her resilience. We both become nervous when we entertain, get upset easily, and are sensitive. She still sleeps with the covers pulled over her head, as I did as a child. Neither of us would leave home before we did our hair, applied makeup, and dressed appropriately. John and I were 17 months apart, yet more like Irish twins. He had dark hair in his youth and favored the Italian family, as our son Darryl does. When he first met Ross, our younger son, I saw a striking family resemblance. John and I both enjoyed books, movies, good food, dogs, travel, and most of all, our families. We planned to write a book about our childhoods called Parallel Lives, but sadly he died suddenly in 2010. Barbara has a positive outlook, can-do attitude, and cooks fabulous food. She teaches school, as John and I both did before embarking on other careers, and possesses more patience than anyone I know. Meeting them brought up many questions from my birth family. My Italian Catholic mother could not understand why her father placed her firstborn with a Jewish family only five miles from their home. I explained that my two families were more alike than different and why my early nurturing played a huge role in the person I’ve become. Ruth collected antiques and taught me to appreciate music, the arts, history, and books. 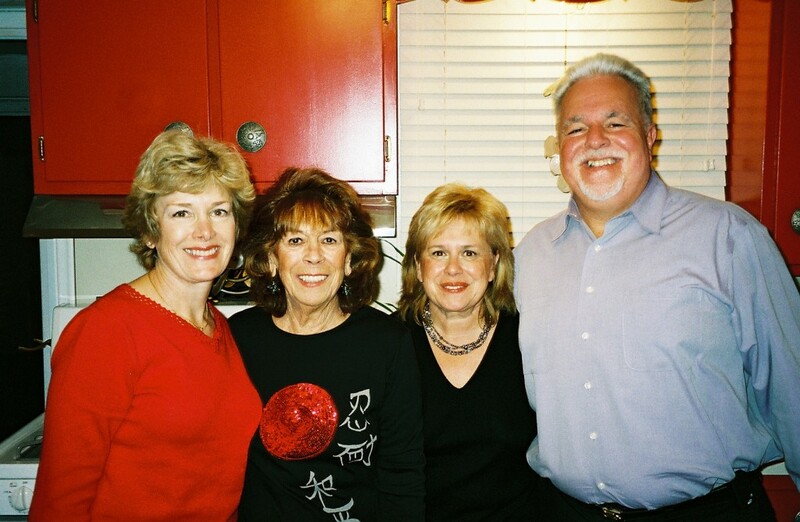 Her superb cooking and baking led me to enjoy food, and her devotion to family and friends made her loved by all. Harry had a generous spirit, helped others find work, and took us on Sunday family outings. He treated others well, as did Bob, who would help anyone in need. Both families shared similar values. They were generous, despite different incomes, valued their families, education, religions, music, and good food. They both kept secrets and might be chagrined by my tell-all. Most of all they both wanted the best for me, as most parents do. In the end, I’m a blend of three families, the one in which I was born, the one in which I was raised, and the one Don and I created together. But if you look into my eyes, you’ll see both families. Both mothers, sisters, and I have hazel eyes. Libby J. Atwater has been telling stories other people’s stories for 25 years and decided it was time to tell her own. Her memoir What Lies Within is available on her website, www.chooseyourwords.net and through Amazon and Apple. This blog offers a glimpse of its sequel What Took You So Long? Awhile back I created a printable with the help of Lisa White of Moxie Pear. It’s meant to get people thinking about the things they have in common with their family, the idea being that the more you know about your family, the more you know about yourself. I also said I’d feature bloggers’, friends’, and family’s filled-out versions of the printable every so often. (Readers are welcome to submit their answers too!) So recently I asked family historian Gini Webb if I could feature her filled-out printable, and she graciously agreed. Gini is part of the genealogy community and used to run the May I Introduce to You column on Geneabloggers, which is how I met her. She has a lot in common with her mom and an aunt she just met a few years ago, and she’s the spitting image of her father. 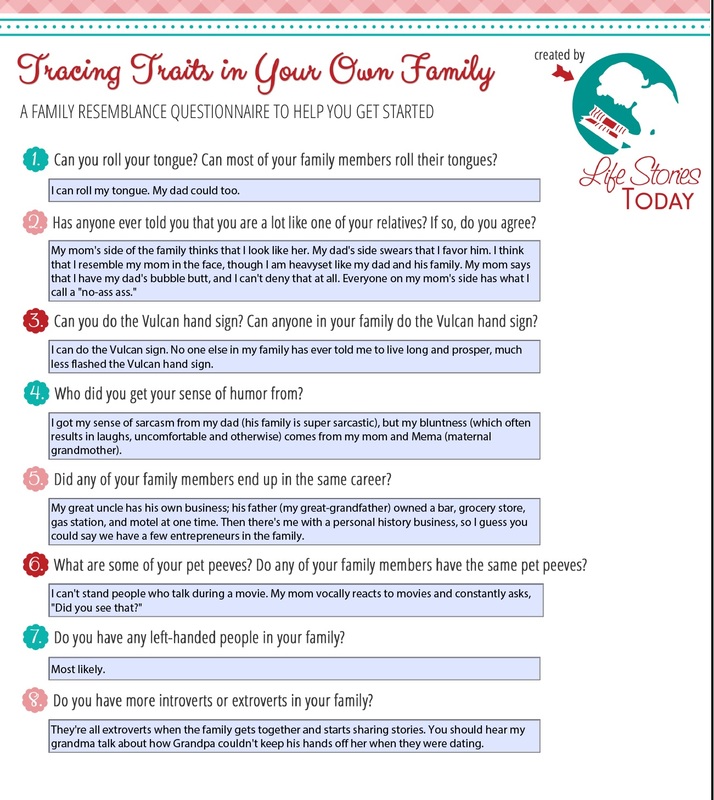 To get the Tracing Traits in Your Own Family printable, go to the sidebar, find the subscribe area, type in your email address and hit subscribe! You’ll only get emails from me when I write a new blog post; I promise no sales stuff, newsletters, or other miscellaneous annoying junk email. I just realized I forgot to post some of the guest blog posts I wrote this year. Okay, and maybe I didn’t think one or two of them were relevant to this blog. But you know what? I’ve decided it’s all relevant! This blog is just as much about my life as it is about my family’s, and family resemblance in general. So, without further ado, introductions and links to my guest blog posts! Starting with the oldest guest blog post, this was posted in March. It’s about travel, exploration, and studying abroad in the Netherlands, and is a part of Sonia Marsh’s Gutsy Living Series. This was published in May. It’s about Random Acts of Kindness and Messages in a Bottle done in collaboration with the fabulous guerrilla artist, Mary England. “I love reading stories about people finding bottles with messages inside of them. I like imagining the original message-writer flinging a bottle into the ocean, not knowing where and when their letter will be read. It’s especially exciting when the bottle is found 50 or 100 years—and many travel adventures—later. Then it’s a Message in a Bottle and a time capsule! In June, I was interviewed by Sarah Von Bargen for her True Story interviews, which feature “people who have experienced interesting/challenging/amazing things.” I talked about being a personal historian. 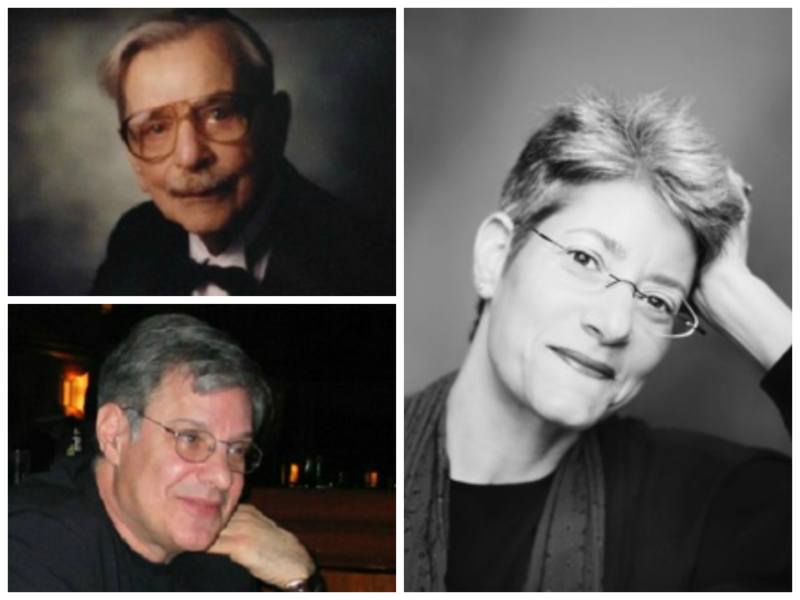 What does a personal historian do? And how did you come to do this as your career? Most people have never heard of my profession, so I usually say I help people save their life stories or that I’m part ghostwriter, part historian (ghostorian?). Basically, I interview people to get their stories, then transcribe and edit their words into a narrative. Once that’s done, I collect photos from the person’s life, layout the book, and send it to a printer to be printed. I can also provide an audio version of the interviews. Of course, those aren’t the only two mediums that personal historians use. There’s also video and digital media as well. I met Jenny Williams through the Yes and Yes interview. She and a few other gals wrote to me because my interview inspired them to consider becoming personal historians (yay!). 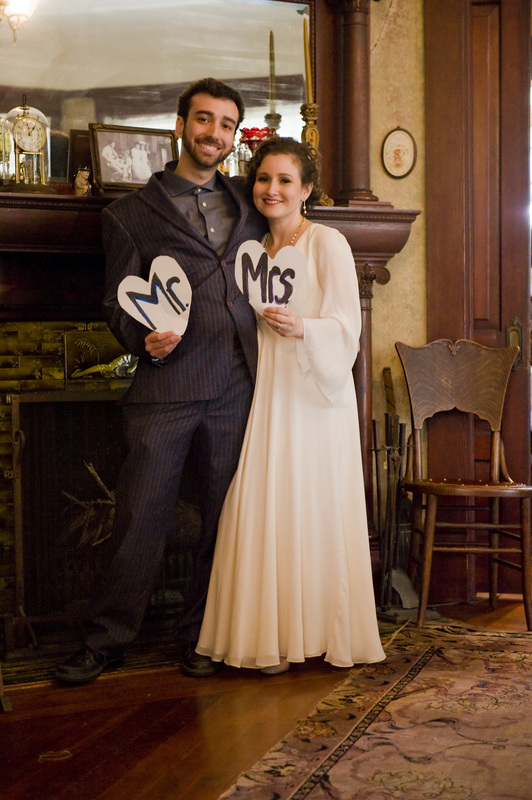 She did a guest blog post for me, and then I asked if I could do a guest blog post for her. (Her blog is really cute and she’s a great writer, so I had to ask!) One of Jenny’s favorite topics is books, so I wrote about three books that shaped my life (spoiler alert: The Diary of Anne Frank, Lauren Bacall’s autobiography, and my grandfather’s Korean War memoir). My love affair with books started at an early age, so even with some less passionate years (I’m talking about you, year I was forced to read The Scarlet Letter and Heart of Darkness in English class) I’ve still loved a long list of books. I could easily write a prolific, interesting-only-to-me dissertation on them and their influence on my life, but there’s only a couple books that left a significant mark on my life path and sense of self. Alright, no more guilt for me! (The first time I wrote that sentence, I said, “Alright, now more guilt for me!” Talk about a Freudian slip.) Now we’re officially caught up. On to new adventures! I happened upon Rabbi Elana Zaiman while exploring Twitter one day. 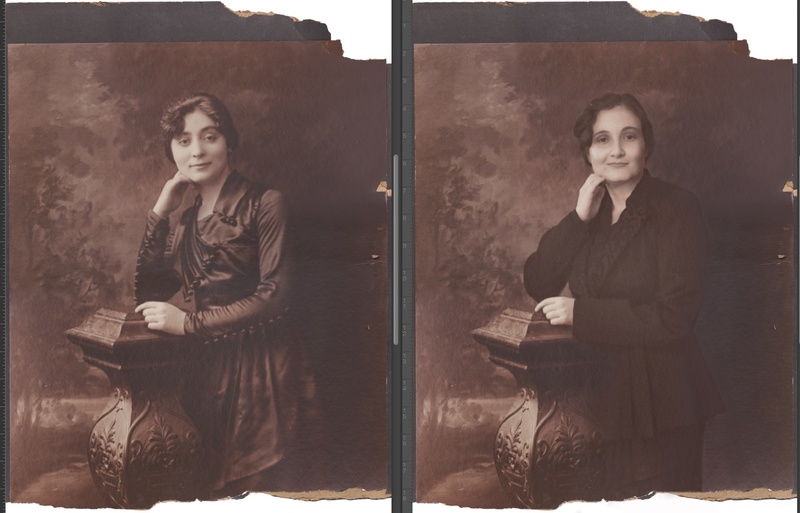 I was immediately struck by her description, “First woman rabbi in a family spanning 6 generations of rabbis.” Because I’m always interested in familial similarities, I was fascinated with the idea of coming from a family with so many generations of rabbis. I wondered if becoming a rabbi was an inherent desire or the expected thing to do. So, I asked Rabbi Zaiman if she wouldn’t mind answering those questions in a guest blog post, and she graciously agreed. I am the first woman rabbi from a family spanning at least six generations of rabbis. 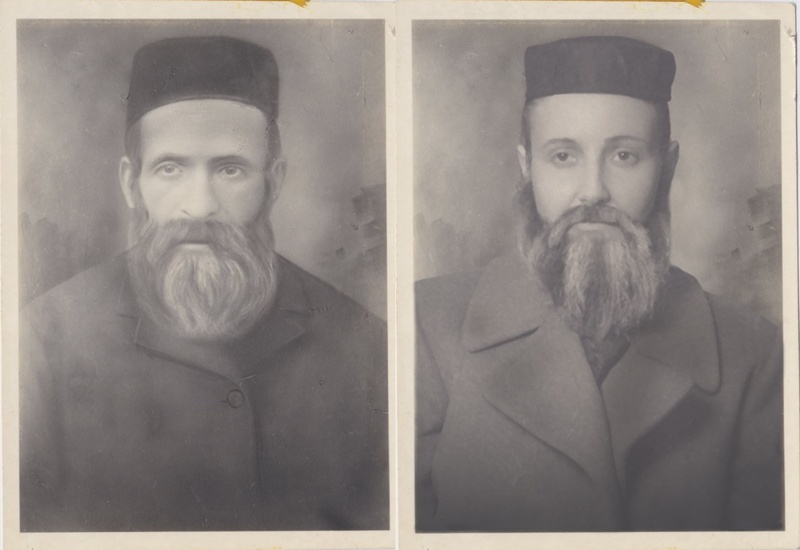 I’m not sure why so many of my ancestors were rabbis. I imagine it had to do with living in Eastern Europe and continuing on in the family trade, a desire to become a rabbi, an expectation that this was what one was supposed to do, or, perhaps, limited career options. I do know from family lore, that my grandfather had wanted to become a doctor, but his family could not afford to send him to medical school. 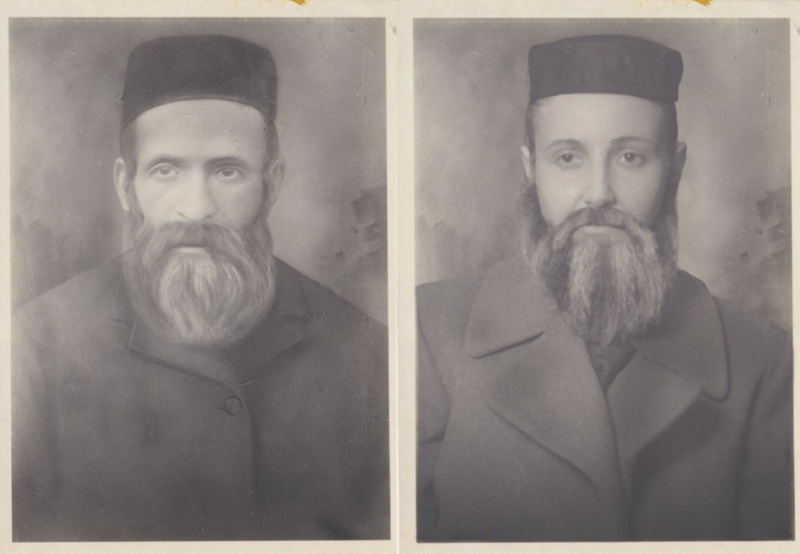 Of all these rabbis, I only knew two: my grandfather and my father. And while I got to see my grandfather as an active congregational rabbi before he retired, it was my father whose rabbinical life I witnessed up close. He was an excellent teacher and public speaker with an engaging, powerful, and charismatic personality. He had strong values. He worked hard and valued hard work. Because he was such a public figure, I found myself watching him closely, and watching how others responded to him. I noticed that he was respected and admired not only by his congregation, but by the Rhode Island Jewish community at large. I, too, respected and admired him, so much so that I imitated him. On Saturday mornings, when I did not go to synagogue, I would become “the rabbi.” I would set my stuffed animals in a circle on the floor of my bedroom, put yarmulkes on their heads, prayer books in front of their faces, and conduct the Saturday morning service, singing songs and announcing pages, perhaps even delivering sermons, though I don’t recall. I do remember walking around the outskirts of the circle, stopping at each stuffed animal, and turning his or her page. At this stage of my life, however, I did not aspire to become a rabbi. Women were not rabbis. The Conservative movement—the branch of Judaism with which I was affiliated—was not yet ordaining women. Why would they? In many (most) Conservative synagogues women were not allowed to lead the community in prayer, nor were they allowed to read from the Torah. In my father’s synagogue the only honor given to women was pulling the drawstring to open and close the ark. I also attended an Orthodox Jewish elementary school, where I was taught that the woman’s role was in the home and not in the synagogue. This irked me, because I could pray more quickly and with more fluidity than many of my male classmates, and because I had a real love for prayer and singing, unlike many of my male classmates. I questioned the fairness of the role of women in these settings, and remember once asking my father why women couldn’t be rabbis, but I asked these questions more out of a desire to understand than out of a desire to become a rabbi. I had other plans. I wanted to become a child psychologist and work with special needs children. In my senior year of college, when my father forwarded me a letter on The Jewish Theological Seminary’s letterhead announcing their decision to accept women into rabbinical school, I still had no desire to become a rabbi. Let me be clear: My father had not sent me this letter to encourage me to become a rabbi, nor had he sent me this letter because I had expressed an interest in the rabbinate. He sent me this letter to share with me an historic decision. When we spoke about this letter we both agreed that the first women who chose to enter rabbinical school would have a hard time of it, so hard a time, why would any woman want to do it? It was after working for two years as a Program Director and then Acting Director of Hillel at Tufts University that I began to consider the rabbinate as a career, and only after working for another two years on a Masters in Judaic studies and a Masters in Social Work, that I decided to apply to rabbinical school. My decision came from my love of Judaism, Hebrew, and liturgy, from my longing to create meaning in my life and in the lives of others. My decision came from a desire to counsel, serve, and inspire others from the heart. No, I wasn’t called to the rabbinate as in I had an epiphany that this was the path I had to follow. It was much less dramatic and much more logical. The rabbinate was a profession I had grown up with and somehow understood. It was a profession I could imagine myself in. My father tried to dissuade me. In part, because he came from an Orthodox background and was not comfortable with women in the rabbinate, and in part because he anticipated that with the decision being so new, many Conservative congregations would not want to hire women rabbis. He was right. Initially, many congregations were not interested in employing women as rabbis, but by the time I was ordained in 1993, this was less of an issue than he had imagined. My father was not the only one who was uncomfortable with me becoming a rabbi. It was hard for me too. Having attended an Orthodox Jewish elementary school and attended my father’s traditional Conservative synagogue, I sensed that becoming a rabbi was something tradition did not intend for me—a woman—to do. I had the sense that had my grandfather been alive, he would have had no trouble voicing his disdain at my career choice. So, when I was accepted into rabbinical school, I spent several years in therapy trying to unlearn the distinctions that had been ingrained into my being, and to convince myself that it was okay for me, a woman, to become a rabbi, to lead a congregation in prayer, to read from the Torah, to officiate at baby namings, bar and bat mitzvahs, weddings, and funerals. Once I was ordained, it took me time to get comfortable with my new role. Rabbi Zaiman was my father. Rabbi Zaiman was my grandfather. Rabbi Zaiman was not me. 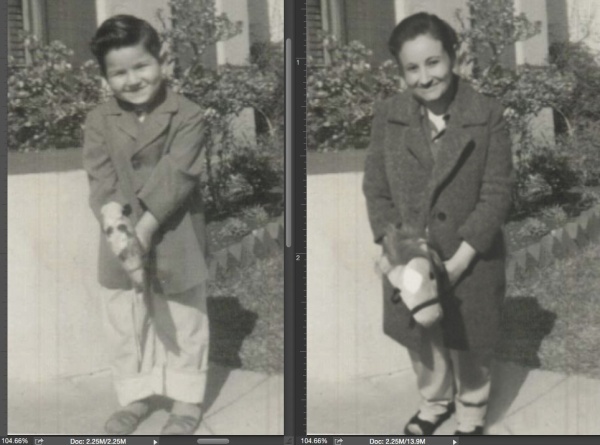 For my first few months as a rabbi at Manhattan’s Park Avenue Synagogue, when people sought my attention by saying, “Rabbi Zaiman,” I kept turning around and looking for my father. It took me a while to realize that I was the Rabbi Zaiman to whom they were speaking. When I told this to my father, he chuckled. He said that he had had a similar experience when he had been ordained, that he too, had done a double take when people asked for Rabbi Zaiman. I have only one child, a son, who is now fourteen. Will he decide to become a rabbi and carry on my family tradition? If I were to answer today, I’d say, no. He hopes to become a baseball player or a professional cyclist or a Navy Seal. But who knows? He’s only 14. He has plenty of time to change his mind. Maybe he’ll become an architect, a movie critic, or a history teacher. My only hope is that he finds a profession he loves, that brings him joy, that adds meaning to his life, and that enables him to affect the lives of others for the good. Today we have a guest blog from the lovely Jenny over at JenEric Generation. She’s a new personal historian and is quite the wordsmith. Enjoy! Hello, readers of Family Resemblance! My name is Jenny, and I write JenEric Generation–a place for discussing books, writing, and generally avoiding mediocrity in all areas of life. I am thrilled that Rachael invited me to be here today. Rachael inspired me to start my own business as a personal historian (still in the beginning stages), which has left me reflecting on why I love the topic of family history, and history in general. For most people, a love of history does not begin in high school. But for me, that is where it started. I believe that every student would love history, if only they were taught by the right person: someone who is passionate about the subject, and can articulate why it is important today. The why it is important is the hard part. My high school history teacher made the past come alive by painting a picture that connected to the present, in one way or another. History is not just a long story. History is billions of people who have gone before us, living in their own corner of the earth, not constantly aware of the fact that they were part of a bigger picture. And in that sense, they were no different from us. In twenty years, our kids are going to be reading about the economic struggles in the United States in the early 21st Century, and it will most likely be summarized in a few paragraphs in a boring text book. But you and me–we are part of that history right now, and we know it is more than that. Beyond those few paragraphs in a history text book, are thousands of smaller stories that help us understand human nature a little bit more. Within the history that is deemed important enough to be included in a textbook, are the stories that paint individual family histories. My first awareness of the importance of family history came through the stories my dad told my siblings and me growing up. The story of my great grandfather, traveling to the United States from Germany. He was seven years old at the time, and his father gave him the family fortune to keep tied around his neck on the journey across the Atlantic. Because being robbed on a ship was common, my great-great-grandfather hoped that no one would suspect a child to be the keeper of all their earthly wealth. It worked. Later on, he would grow up to have a daughter, my grandma. My memories of her before her mind was overtaken by Alzheimer’s Disease are vague. In fact, aside from the stories my dad and his siblings told, the most I learned about her was at her funeral. I was moved by the stories of everyone who loved her–sharing how they had been touched by her kindness and genuinely sweet spirit. She never raised her voice. She always took her time making lunch on Sunday afternoons. She loved her family well. I love knowing that I get my full cheeks from my grandma. I want to be always kind, like her. I love knowing that my great grandpa and his family were adventurous, courageous people who dared to start a new life in a foreign country. It makes me feel like I am part of something greater; and gives me permission to come out of my small thoughts and small world, and focus on the bigger picture I belong to. We’re not alone. The lives we live affect people, and they forge a path for future generations to walk down. In our lives, we don’t have to achieve worldly success or fame to make a difference. Simply making good choices every chance we get, and loving the people in our lives well, makes a difference. We are all making history, whether we realize it or not. I never thought I’d change my opinion about the spilling piles of paper, magazines, and other random things my mom kept all around the house. They were annoying; they made the house look messy and if anyone tried to throw something out, my mom would get mad. Mostly, I didn’t understand the appeal of holding on to ephemera. Ephemera is supposed to be transitory; it’s there and then it’s not. Old advertising, museum brochures, movie tickets, scribbled notes, fortune cookie messages. Ephemera: a polite word for junk. But when your mom passes away, your perspective shifts. Your sense of normal—which included having your mom in your life until you were at least middle aged—is altered. You reevaluate your expectations and priorities. Several months ago, my dad and I started going through my mom’s stuff, and I found myself confronting these piles again. This time though, the piles weren’t annoying. They were actually kind of comforting, reminding me of what life used to be like before. Still, I didn’t expect to find what I found. Mixed in with the long-expired coupons, disintegrating cough drops, and balled up Kleenex, I found things I had never seen before. I had no idea she kept the front page of the newspaper from the day I was born. Brochures on breastfeeding and eating for two. Graduate school papers, response cards from my parents’ wedding, one of her job’s information packets, home movies from her childhood. Poems, drawings, every letter she ever received from her childhood friends, from the age of 12 when she left Michigan, until the last year of her life. Drawings my brother and I made when we were little, some of our toddler clothes, report cards. She had saved her memories. 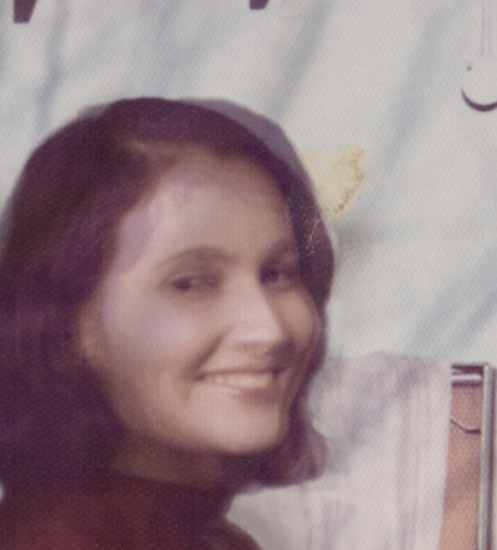 It wasn’t a memoir, like my grandfather wrote, but it was a peek into her world. Because she saved things she liked and wanted to remember, I’ve been able to get to know the younger version of my mom, seen her as a person first, and my mom second. I’ve come to understand her more, appreciate her more. Miss her more. 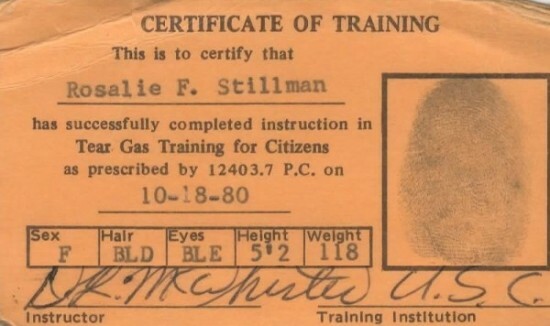 Apparently my mom had tear gas training. Not sure when that would have come in handy. Yet I’m still conflicted by these piles. She didn’t just save things she liked, she saved things she couldn’t bring herself to throw away. To get to the things that really meant something, I had to weed through the things that my mom forgot about. It’s a lot easier to miss the good stuff that way. Delivery record from my birth. I was born 25 minutes after my mom got to the delivery room. The piles also mean that I have to make the choices she never did. I get to decide what was important to her and what wasn’t. That’s a lot of responsibility to place on another person, especially when that person is still grieving. Inevitably, this process has gotten me thinking about my own mementos. Because I don’t want the decisions I didn’t make to speak for me—I want to speak for me. I’m not nearly as inclined to keep things as my mom was, but I still do have some of my old toys, essays, Kid City magazines, and random tchotchkes. And for now, I want to keep most of those things. They represent the person I used to be and trigger childhood memories. 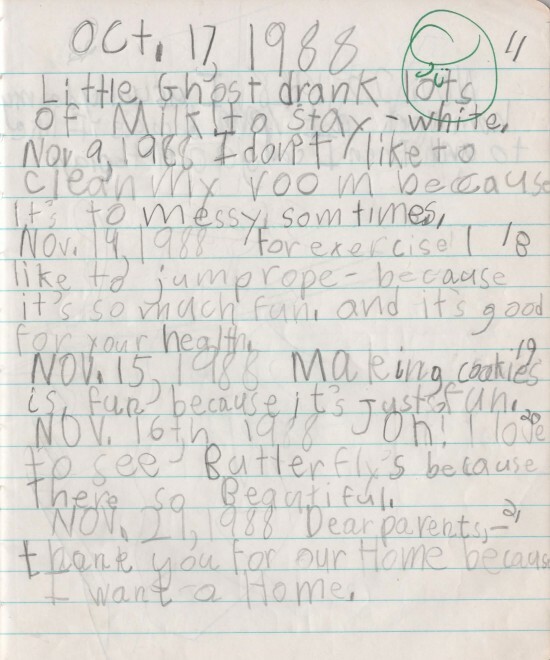 I was in 2nd grade when I made these astute observations in my school journal. I know I can pare my stuff down further though. I’m pretty sure no matter how many She-Ra books I have, I won’t forget how awesome she is. I doubt I’ll regret getting rid of the doll I never liked and the random ugly trinkets. So I’ve been culling down my current collection of memorabilia, and taking a more critical look at the things I choose to keep. Now before I indiscriminately toss or keep something, I take a moment to ask myself what I want to remember. Will I want to look back at old cards? Which projects are worth taking up space? Should I get rid of the 1930s hat that I love but rarely wear? In other words, what is important to me? I think of it as curating my life. As the expert on all things me, I’m the best person for the job. Since the theme (and name!) 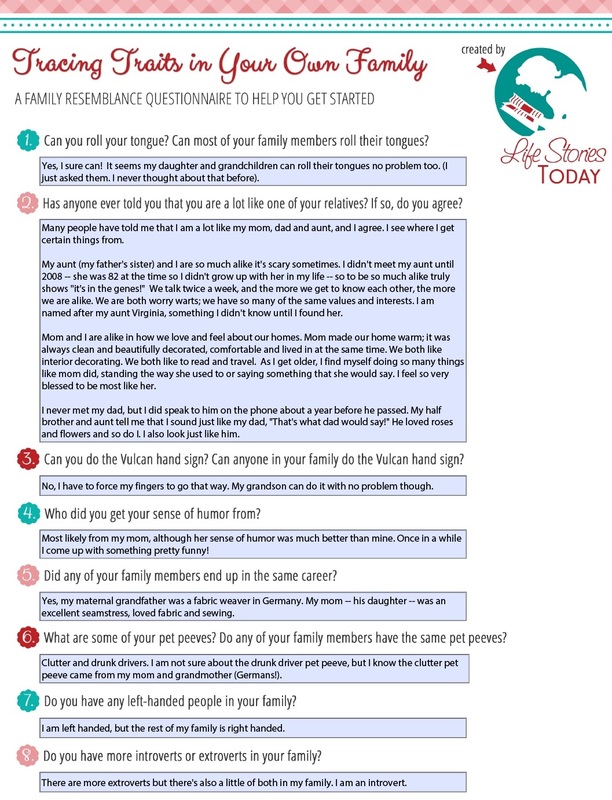 of this blog is Family Resemblance, I thought I’d create a printable that helped people start identifying the similarities in their own families. There’s two family activities and eight questions about things like your family’s ability to whistle. It’s been cute-ified by Lisa White of Moxie Pear. To get the printable, just go to the sidebar, find the subscribe area, type in your email address and hit subscribe! You’ll only get emails from me when I write a new blog post; I promise no sales stuff, newsletters, or other miscellaneous annoying junk email. I’m also going to be featuring bloggers’, friends’, and family’s filled-out versions of the printable every so often. Readers are welcome to submit their answers too. 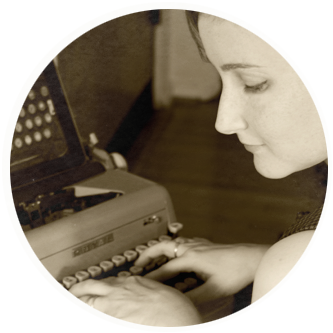 Today I’m featuring fellow personal historian Alisha Morgan of Paper Clipped Memories. She works with families to create everything from celebration books and family cookbooks to family histories and family tree word art. Her final products are not only fabulous, they’re pretty too! Alisha is a Southern gal with a wicked sense of humor and quite an interesting family, as you’ll see below. My mom had just gotten home from a trip when she heard the phone ring. She’d been in Los Angeles meeting my dad’s family for the first time, and it was my dad on the phone checking in to make sure she got home safe. In addition, he was also wondering if maybe she’d be interested in marrying him. She was, actually. Even though he was asking her over the phone mere hours after they’d been in each other’s physical presence. Even though she didn’t get a bended-knee proposal and couldn’t excitedly hug him for a little while, she still wanted to marry him. Now, he could have had that moment of revelation and then waited to ask her in person. But there’s another reason he asked her over the phone. If my mom said no he could just get off the phone afterward. And those are some reasons to ask a person to marry you over the phone. Hey, it was better than not asking, my dad pointed out, and he’s quite right about that. After all, I wouldn’t exist if he hadn’t asked. So it all worked out, but I would never say yes to a proposal like that. Not that I was ever expecting to receive a proposal like that, because who would propose to someone over the phone anyway? Well, besides my dad, of course. It wasn’t my fault though! My soon-to-be fiancé, Joey, and I were on the phone talking about his upcoming visit the following week, when all of a sudden he said he wanted to ask me an important question in person. A question he couldn’t ask me over the phone. We had already talked about the other big things. We had said we loved each other and wanted to live together, so there was really only one important question left. Basically he had just announced he was going to propose to me in a week. That is absolutely not how a proposal works! You either propose or you don’t propose. You don’t leave people in proposal purgatory. Armed with the knowledge that a proposal was in my near future, I had two options: wait until I saw him or ask him to marry me over the phone. In other words, I could be laid-back about it and just wait for a romantic proposal in person (it was going to involve rose petals, I later found out), or I could be impatient, get all worked up, and ask him to marry me over the phone. Less than a minute later, I had a fiancé that I couldn’t hug or kiss for another week. My mom always said I should learn to be more patient. Come to think of it, she said the same thing to my dad sometimes. While the similarities might seem obvious, I didn’t make a connection between the proposals for years. I was too busy focusing on the differences. For instance, my dad was 23 and my mom was 24 when they got engaged. By that point, they had been dating for about a year. In contrast, I was 19 and Joey was 20. And did I mention that we had only known each other for a month? Before I explain, I’d like to point out that Joey and I have been married for over a decade now. So no matter how crazy we may seem in the story below, just remember we’re still together today. Joey and I met through friends the summer before our junior year of college. A group of us were all meeting at one house and carpooling to Venice Beach in a SUV. Joey wasn’t even supposed to go but when an extra row of seats refused to go in, someone remembered Joey’s mom had a Suburban. At first he wasn’t sure he’d be able to make it because he was supposed to pick up his dad at the airport, but at the last minute his dad decided to take a later flight. Back at our starting point, Joey offered to drive me home even though my friend had driven me there and my house was completely out of the way. During the ride, he told me stories about his life, and my perception of him changed again. I thought for sure he was going to try to kiss me when we got to my house (at least, that’s what I was hoping he would do), but he didn’t even ask for my phone number. That really confused me. We got together as a group a couple more times over the next three weeks. Joey and I usually ended up gravitating toward each other, spending most of the time talking alone. The last time we all hung out was the day before my family’s annual summer trip to Mammoth Mountains. After that, I’d be heading off to the Netherlands to study abroad for a semester, and Joey was going back to school in Florida. We wrote letters, emails and talked on the phone. We’d talk for hours and hours. He said he loved me, I said I loved him, we got engaged. He flew out to visit me and we spent the weekend in Paris. 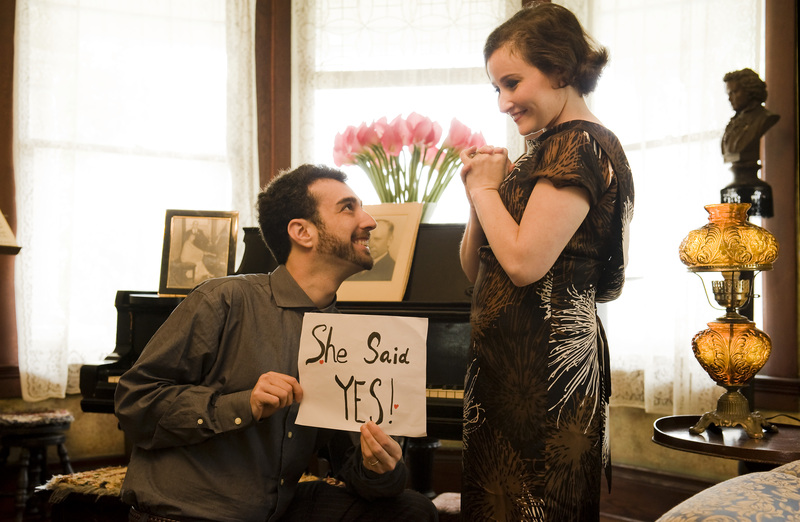 He waited until he was back in Florida to tell his parents we were engaged. By that point, we’d known each other about a month and a half and had been a couple for three weeks. I waited a few more weeks to tell my parents because then I could at least say Joey and I had been together for two months. Sadly, that extra month didn’t make me sound as mature and responsible as I’d hoped. Needless to say, they didn’t take it very well. From then on, it was an endless stream of wedding planning and people trying to talk me out of getting married. One of the only people who didn’t object was my grandmother. She said she really couldn’t say anything bad about it because she and Grandpa had gotten married pretty quickly too. 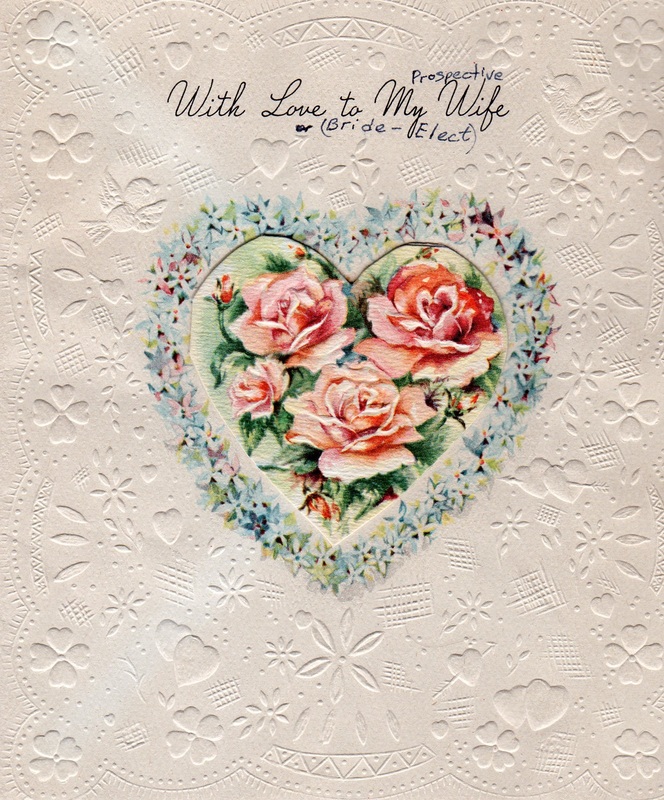 She didn’t give me the details, but the old love letters I found years later filled in the blanks. Turns out they had only been together about three months when they got engaged, and eight months when they married. 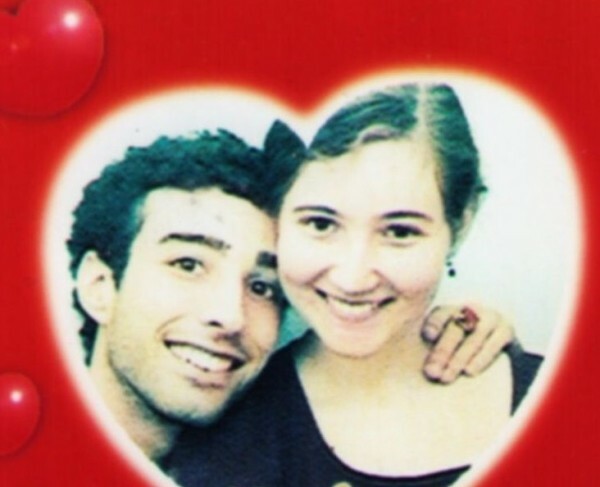 She was 22 and he was 24. As of February 2014, we’ve been together 12 years and married 11 years. 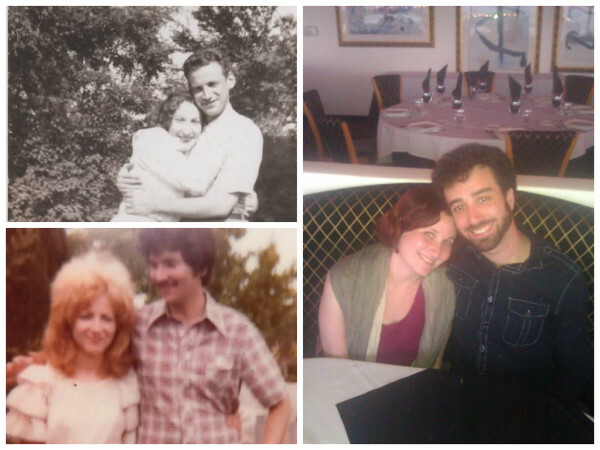 My grandparents were married 55 years and my parents were married a few months shy of 35 years. I’m hoping to follow in their footsteps in that way too. So far so good. When I first read my grandfather’s collection of Korean War letters (aka his Korean War memoir), I was surprised they were so lovey-dovey. Don’t get me wrong, my grandparents were loving, but by the time I came on the scene they didn’t really seem that in to nicknames and constant professions of love. 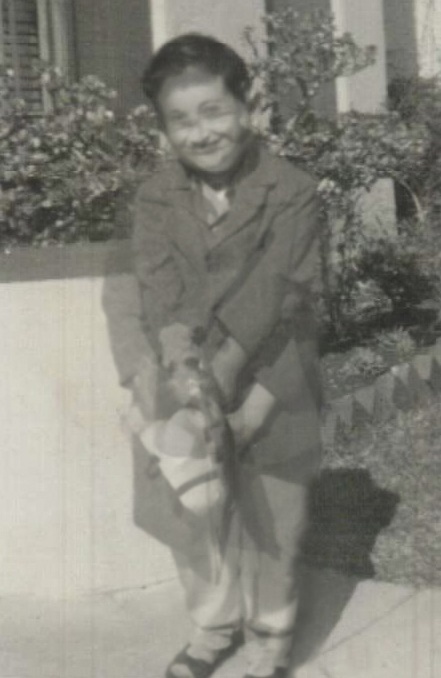 Korean War-era Sidney Goldstein, on the other hand, was all about nicknames (he called her Beautiful, she called him Budgie Doodle), love and kisses. Of course, it made sense. My grandparents had only been married three years when my grandfather left for Korea, so they were still in that honeymoon phase. They were just so different from the grandparents I knew. The grandparents I knew spent most of their time focused on my grandmother’s illness. 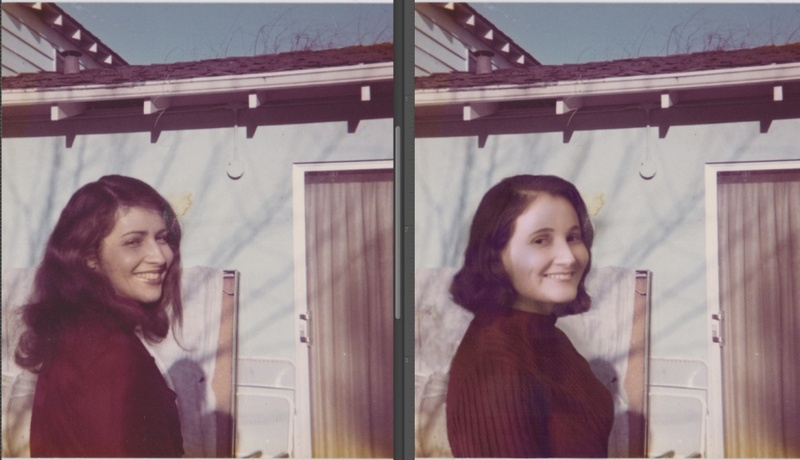 In the late 1960s, my grandmother was diagnosed with MS. 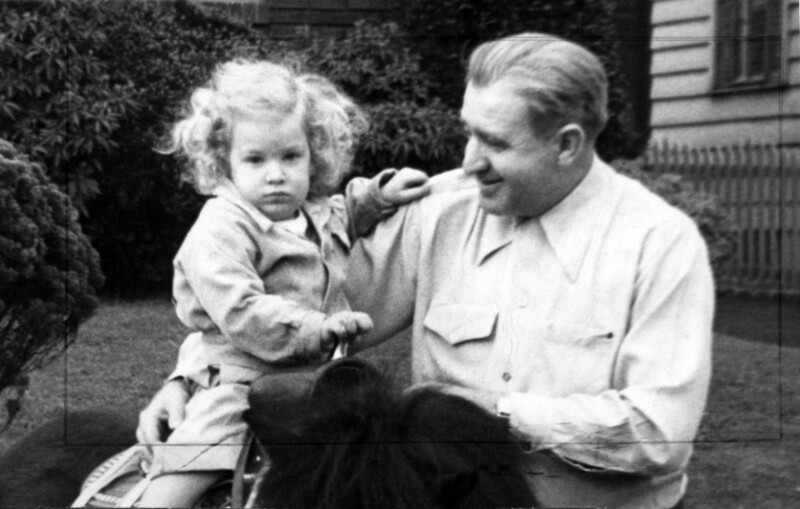 Ten years later she was confined to a motorized scooter and my grandfather, as her husband and a doctor, became her caregiver. Over the course of his memoir, however, I got to know the young versions of my grandparents and began to see them in the grandparents I knew. The devotion they showed to each other later in life can certainly be traced back to those first years as a couple. 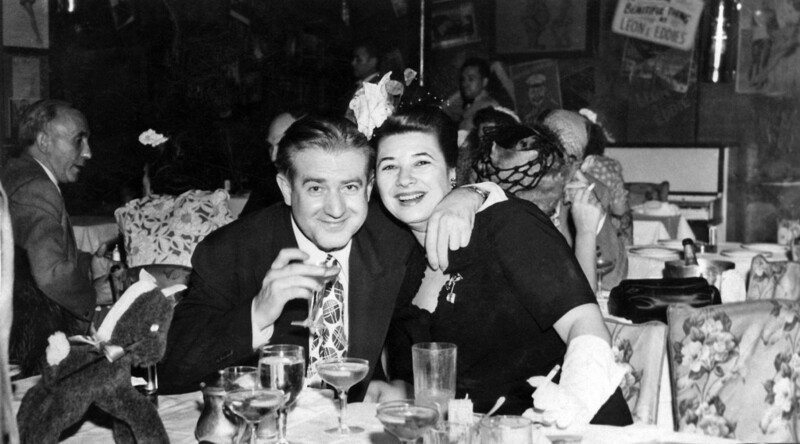 In the late 1940s, my grandparents were both attending Wayne State University. He was there to become a doctor and she an elementary school teacher. A school dance was coming up, but they both had reasons not to go. By all accounts, my grandfather hated to dance. My grandmother had a test the following day, so she wasn’t sure she’d be able to make it. In the end, my grandfather’s roommate convinced him to go (“His roommate was a good influence on him,” my grandmother used to say) and studying took a back seat to dancing. A friend of my grandmother’s introduced them and the rest is history. I had grown up hearing this version of how they met. It’s cute but there’s nothing about why they liked each other or how they felt; no little details that allowed me to imagine my grandparents as they were then. That’s where my grandfather’s love letters and Korean War memoir came in. In one of his Korean War letters, my grandfather referred to their initial meeting. At first I was really excited to hear him refer to the day they met. Then he started talking about the Book of Ruth and it all went downhill from there. Not only did he use a cheesy pick-up line (and I never thought he’d be one of those guys), he used a cheesy biblical pick-up line. I really wasn’t expecting that. Now there’s an adorable detail for you! Just that one line tells you so much. First, that my grandfather was pretty smitten, and second, that my grandmother thought it was weird to kiss someone she didn’t know well. Pretty good stuff. The little devil part kind of grosses me out (I don’t even want to think about what he did to earn that nickname), but it sure does embody that giddy lovesick phase of a new relationship. 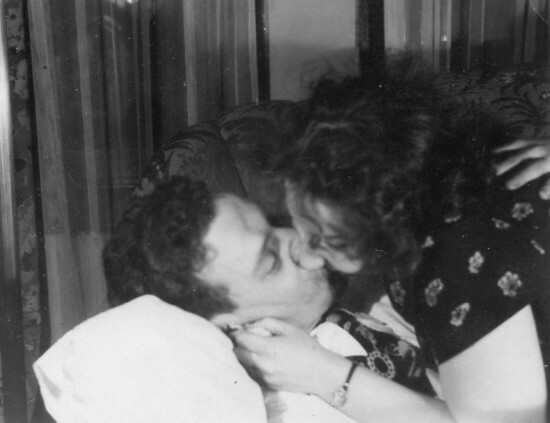 My grandfather’s caption was: Kissing on couches is all right especially if it’s right side up and on Passover when we’re full of wine. Okay, that was pretty cheesy too, but I have to give him points for writing a poem. A really sweet, heartfelt poem, that just so happens to be oozing with cheese. An important tidbit emerged in there too. I’m pretty sure he was implying that they first met in November of the previous year, which would mean they only knew each other four months when they got engaged. It would also mean that he was signing his letters with love and kisses just one month after meeting. Hmm…no one ever told me they moved that fast. Would have been nice to know when everyone was telling me I was getting married too soon. But that’s a story for another day. 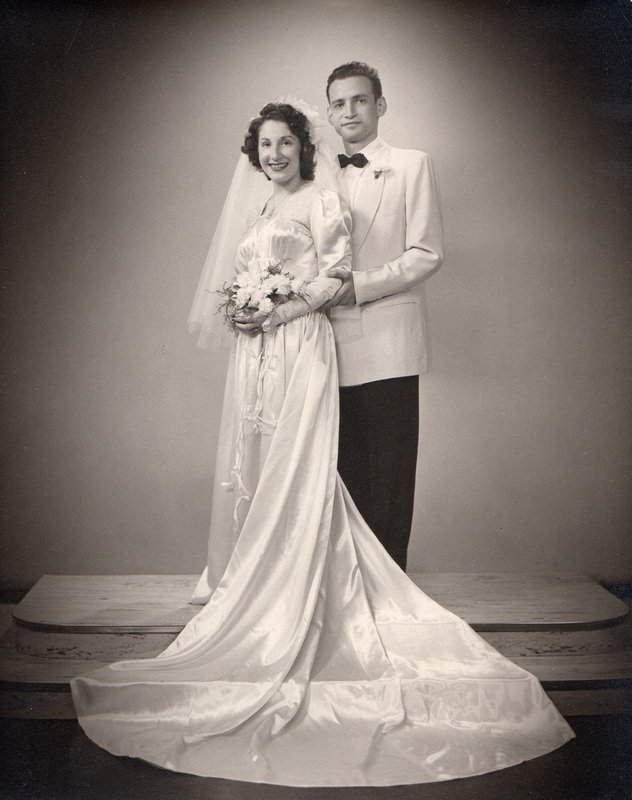 My grandparents married on June 20, 1948 and graduated from school a year or two later. In 1951, my grandfather was in his first year of residency and my grandmother was teaching elementary school. That’s where they were in their lives when the Korean War separated my grandparents, and my grandfather went back to expressing his love for her on the written page.